Washington Street Mills and The Cocheco Mills in Dover. Courtesy of Chinburg Properties. Dover’s history stretches back almost 400 years&comma; but many in the growing city on NH’s Seacoast believe its best days lie ahead. Construction is seemingly everywhere in this city’s vibrant&comma; walkable downtown bisected by the Cocheco River. Former textile mills that have anchored Dover for generations are adding new apartments and drawing eclectic businesses. Meanwhile&comma; developers can’t add apartments and commercial space fast enough. It’s not just downtown that’s thriving these days. A new retail plaza in Dover’s main commercial district will soon open with a Chipotle&comma; Firehouse Subs and other national chains. More than 100 new luxury apartments fetching up to $2&comma;300 a month are almost sold out on Dover’s South Side&comma; and the developer will soon begin a new phase with 120 more units. Without a doubt&comma; Dover has benefitted from recent growth in Portsmouth&comma; where the cost of living is surging along with parking and traffic issues. But Dover also has reaped rewards from careful planning&comma; a clear vision and effective leadership. It also has invested in itself&comma; with an $11 million downtown parking garage and $87.5 million high school set to open this fall. And the city has partnered with developers on several key projects. Notably&comma; these multi-million dollar bets are paying off. Dover grew by almost 5 percent between 2010 and 2017 to 31&comma;398 people. It has the lowest median age of any NH city at 35.4 years and the unemployment rate is hovering around 2.3 percent. Growth and development have yielded new challenges for local policymakers that include traffic and parking. Demand for housing has pushed up home prices&comma; and rising home and business rents have some longtime downtown businesses feeling anxious as they look to extend leases. Dover’s downtown is already bustling. During the last year&comma; local artists and downtown businesses launched a monthly art walk&comma; and the summer arts and entertainment series at the Henry Law Park bandstand brings hundreds of people for events held throughout the week. Wednesday afternoon farmers markets are another big hit. 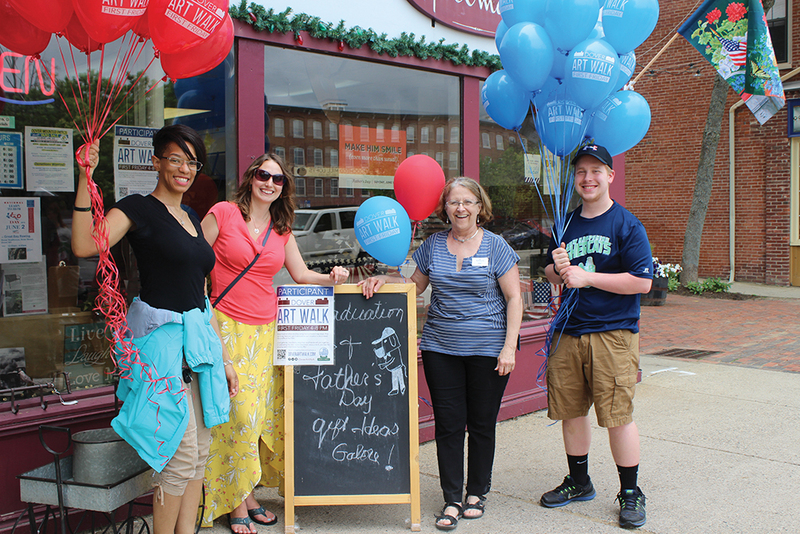 Participants in the monthly Dover Art Walk. Courtesy photo. 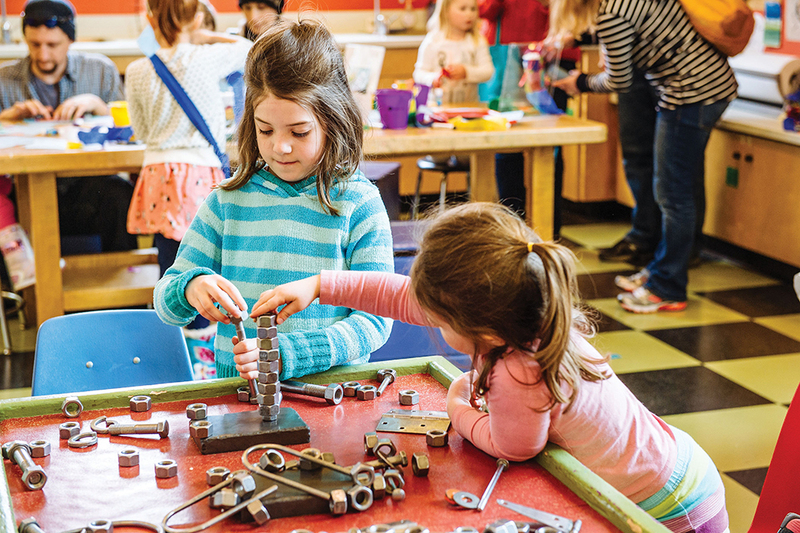 The Children’s Museum of NH has long been a regional draw since relocating from Portsmouth a decade ago. More than 93&comma;000 people visit each year&comma; coming from 42 states and nearly 200 NH cities and towns. The newly revamped playground at Henry Law Park&comma; with its splash pad and full-size gundalow sailing barge&comma; also has proven a draw. Guests play with magnets at the Children's Museum of NH. Courtesy photo. Although Portsmouth has earned a reputation as a foodie Mecca&comma; Dover is becoming a dining destination in its own right. There are roughly 30 restaurants downtown&comma; including Stages at One Washington run by James Beard-nominated chef Evan Hennessey and three breweries with a fourth set to open by fall. Chinburg Properties owns the two mills in downtown Dover. The sprawling Cocheco Mill running parallel to Central Avenue has more than 100 loft-style apartments home to young professionals&comma; retirees and students at University of NH (UNH)&comma; which is only 15 minutes away. Rents in the building run from $1&comma;100 to more than $2&comma;000 a month. Chinburg Properties&comma; led by Eric Chinburg&comma; also owns Washington Street Mills. The five-story building is undergoing a multi-million dollar renovation&comma; adding 54 new apartments overlooking the park and Cocheco River. Most will be studios likely to draw young people seeking an urban lifestyle. “A vibrant downtown means a vibrant overall community&comma;” she adds. Many of the city’s residents work at UNH&comma; Portsmouth Naval Shipyard&comma; Pease International Tradeport&comma; Wentworth-Douglass Hospital or Liberty Mutual’s sprawling campus off Sixth Street in Dover. But an increasing number are going to work downtown for tech businesses such as Weather Analytics&comma; Envio 360&comma; outdoor gear maker NEMO Equipment&comma; which was named one of Business NH Magazine’s Best Companies to Work For in NH last year&comma; or startups like Affinity LED Lighting. Young entrepreneurs also are bringing life and creative businesses downtown. 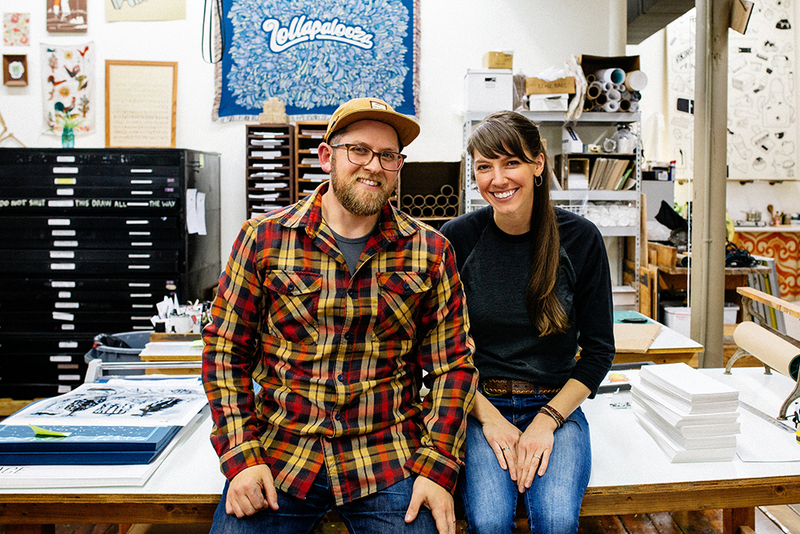 Jason Snyder and Briana Feola opened Brainstorm 10 years ago and moved into the Washington Street Mills four years later. Since then&comma; the husband and wife team have done design work for Patagonia and the Lollapalooza music festival. They sell eclectic art prints in L.L. Bean’s flagship stores as well as hip shops in Boston&comma; Austin&comma; Minneapolis and San Francisco. Jason Snyder and Briana Feola&comma; owners of Brainstorm in Dover. Photo by Anthony Shea. Johnson&comma; the florist&comma; opened The Flower Room four years ago and has seen sales steadily increase. For the first six months of 2018&comma; walk-in sales doubled compared to the same period a year earlier. In fact&comma; business is so good she’s thinking of expanding and adding new services. 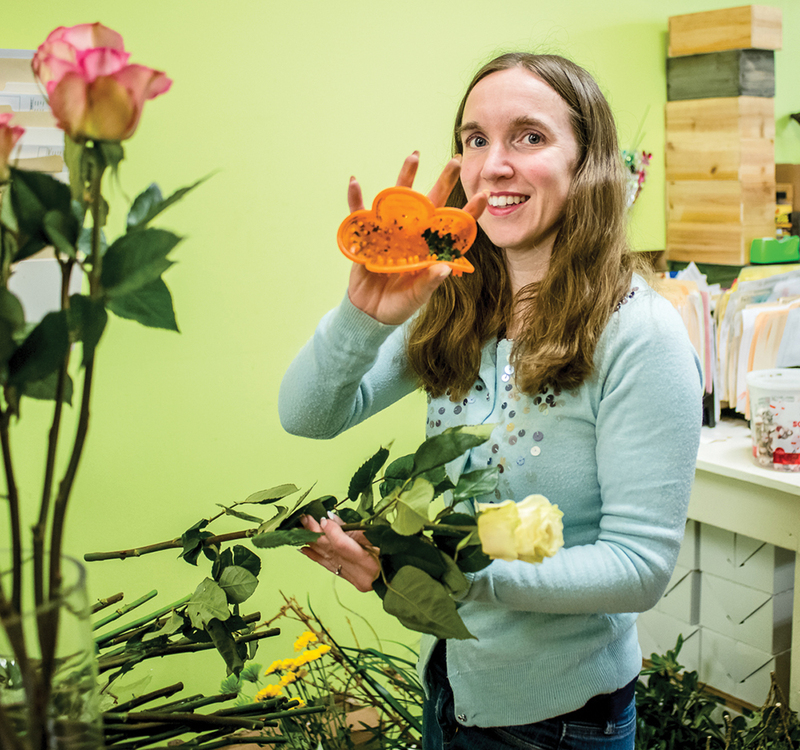 Rebecca Johnson&comma; owner of The Flower Room. Photo by Erin Moore/Mercy Street Studio. That process is already under way. Assistant City Manager Christopher Parker estimates there is currently “north of $40 million in private development” happening downtown. Those projects include a mixed-use project in a former city-owned parking lot&comma; renovation of a five-story brick warehouse into apartments&comma; construction of luxury apartments where a vacant block once stood and redevelopment of a prominent downtown office building. Pre-construction site work is continuing on a Cocheco River waterfront project that the city hopes will attract large-scale development&comma; and a modern-looking mixed-use workforce housing project is nearly finished on upper Central Avenue. But Dover’s resurgence did not come by accident&comma; and it did not happen overnight. City staff recognized more than a decade ago that the city was running out of vacant&comma; developable land. That meant growth had to come from within. The city updated its land use master plan in 2007&comma; spurring zoning changes adopted two years later. The new standards promoted infill and flexible reuse for existing downtown buildings&comma; according Parker&comma; who oversees the planning department. “It was the planning board and city council that looked at it and said … we have to provide these tools if we want to continue to have a vibrant downtown and community&comma;” he says. The city hired Dan Barufaldi as its economic development director in 2009. During that time&comma; there were vacant storefronts on Central Avenue&comma; underused parking lots dotting the urban core and some residual grittiness from an earlier era. The deepening recession did not help. The city focused on attracting small and mid-sized businesses that account for most of the U.S. job growth. It narrowed its focus to four sectors: advanced manufacturing&comma; high-end services&comma; health care and tourism. These days&comma; Dover’s Enterprise Park business park&comma; built two decades ago with $1 million in public money&comma; is nearly full with 15 companies supplying 750 jobs. It also generates $534&comma;000 annually in tax revenue. Dover also has become a destination for multi-day sporting events that bring families here for several days at a time. There are eight big hockey and swim competitions here annually&comma; and each one generates about $300&comma;000 in economic activity. Additionally&comma; Dover’s Wentworth-Douglass Hospital has merged with Massachusetts General. As a result&comma; it has begun offering new services and procedures and access to acclaimed doctors and specialists from Boston. These days&comma; Barufaldi says&comma; the city hasn’t given up on bringing in new companies. But it spends much of its time selling the community to highly-skilled workers&comma; who make it appealing for businesses to follow. “We are successful largely because Dover is a great place to live&comma;” he says. It’s impossible to consider Dover’s recent resurgence without also recognizing what’s happening outside its borders. The Seacoast has been a job growth engine for some time&comma; as advanced manufacturing and other high-tech businesses have flocked here for its high quality of life and availability of workers. Meanwhile&comma; Portsmouth’s resurgence has also affected Dover. Median home prices in Portsmouth have surged past $432&comma;000&comma; according to Zillow&comma; and sidewalks are often clogged with tourists. Rising rents have squeezed out businesses and young people&comma; many of whom are looking at Dover&comma; which is just 10 miles north. The ongoing Spaulding Turnpike widening will only improve Dover’s position. The General Sullivan Bridge&comma; and the Little Bay Bridge that replaced it&comma; have slowed commuters coming and going from Portsmouth for generations. But in a few years&comma; those twice-daily backups could be history. Contractors are moving toward completion of a quarter-billion-dollar turnpike widening project that will double the highway from two to four lanes between Dover and Newington. With smoother commutes&comma; new demand for housing north of Portsmouth could follow. Dover also benefits from having regular daily service to Portland and Boston via Amtrak and express bus service to Logan Airport and Boston’s South Station. Cathartes is one such firm investing in Dover. The Boston-area developer&comma; which built Port Walk Place in Portsmouth&comma; is building the 130-unit Orpheum Apartments mixed-use project where the mostly-vacant Robbins Block once stood. Cathartes also has reached preliminary agreement with the city to develop Dover’s Cocheco River waterfront. Cathartes Principal Jeff Johnston says the company typically looks for smaller cities with first-class amenities&comma; which is one reason Dover stood out. But&comma; he notes&comma; Dover is extremely well served by its local officials. Johnston isn’t the only businessperson to describe city leaders as progressive. Another was Steve Lieber&comma; founder and president of Dover’s Affinity LED Lighting. Affinity’s sales have doubled every year&comma; and it has won municipal contracts in Concord&comma; Epping&comma; Dover and Manchester&comma; as well as private work enhancing buildings in the Pease Tradeport. 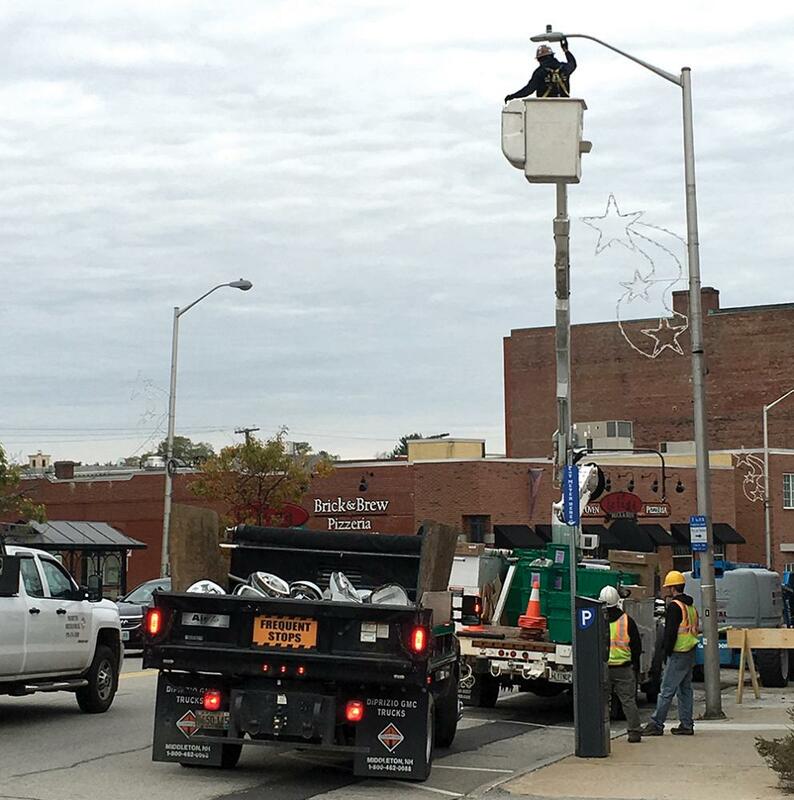 Installation of Affinity LED Lighting in Dover. Courtesy photo. The company’s first big contracts came from the city of Dover&comma; which recognized early on that LED lights use substantially less energy. 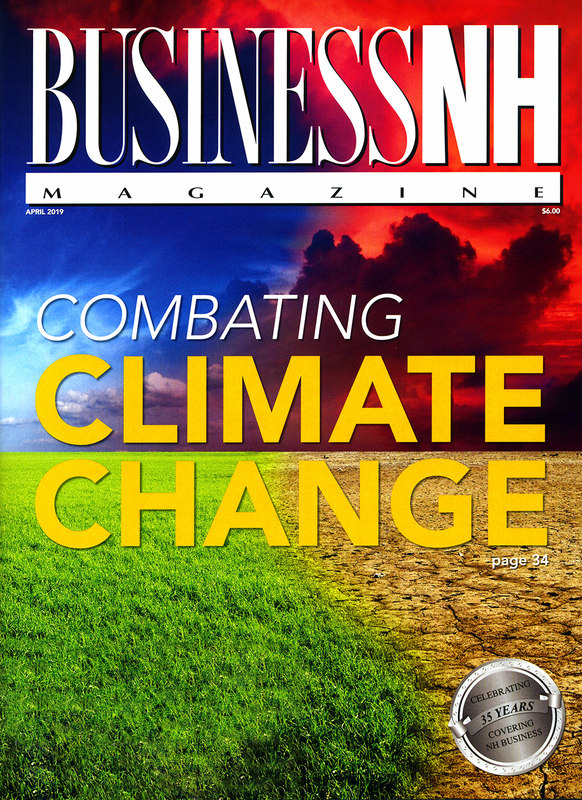 “They have supported energy efficiency improvements across all their facilities&comma;” Lieber says. In addition to lighting&comma; Dover is investing in education with an $87.5 million high school opening this month. The city also has built a parking garage&comma; a new police station&comma; upgraded City Hall&comma; installed a dock on the Cocheco River for paddlers and is extending the Dover Community Trail. The city also is spending $6 million upgrading the Cocheco River waterfront parcel for development. Carefully applied incentives approved by the City Council are another success story. Dover spent $1 million on a roundabout to spur development of the mixed-use Silver Square&comma; which is now the site of senior housing and a boutique hotel. Dover also spent a similar amount on infrastructure for a new business park where Stonewall Kitchen and Rand-Whitney built massive new facilities. Property tax revenues from both sites will repay the city’s investments within about five years&comma; says Parker. Cathartes’ downtown apartment and commercial project&comma; known as the Orpheum Apartments (named for a former movie house that was on the site)&comma; also received temporary property tax breaks through a program approved by the State Legislature. Realtor Peggy Carter&comma; who has operated from a downtown office for years&comma; is another person who labels Dover as progressive. The booming real estate market offers strong evidence&comma; she says&comma; that city officials are making smart decisions. Yet unlike some nearby communities&comma; Dover still offers homes across a broad price range. Starter homes can be found in the low 200s&comma; she says&comma; as well as million-dollar waterfront properties. Her office is on pace to sell more than $25 million in real estate this year&comma; compared to $20 million in an average year. People from other communities are taking notice. Barufaldi&comma; for instance&comma; is selling a family home in upstate New York and plans to retire in Dover with his wife. 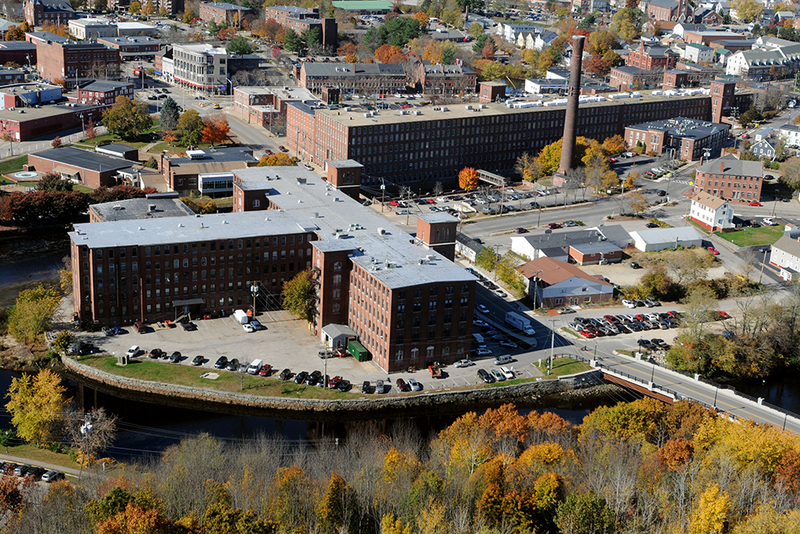 Lieber&comma; of Affinity LED&comma; is considering moving to Dover from downtown Portsmouth.